After Shakespeare’s, Henrik Ibsen’s plays are the most-performed dramas ever written. They were immediately popular and were produced around the world even during his lifetime. Set in his native Norway, the plays explored what lay behind the strict moral regime of late nineteenth-century family life, in particular the role of women. A Doll’s House is the most famous: it centres on the struggles of the heroine Nora and ends with her slamming the door of her house as she walks out on her husband and children. It’s a scene which was scandalous in its day and still provokes debate. 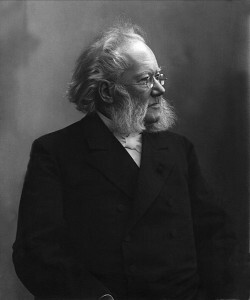 Actresses who have played Shakespeare’s heroines have also distinguished themselves in Ibsen’s plays. And the first actress to play Nora in England was one who had already performed Shakespeare’s strongest women including Lady Macbeth, Portia, Desdemona and Beatrice. She is the subject of an article Before Ibsen: the early stage career of Janet Achurch, 1883-89, in the latest issue of Theatre Notebook (Volume 67 no 2, 2013). by Bernard Ince. Ince begins his article with the statement “An actress of Janet Achurch’s status warrants little introduction”, but although I knew her name I knew little of her career. In fact she was a bit of a mystery to me. Among the stained glass windows known as the Benson windows in the Royal Shakespeare Theatre is one of Janet Achurch in the role of Lady Macbeth. But although she worked with Frank Benson, she never performed in Stratford-upon-Avon, so why was she commemorated in this way? 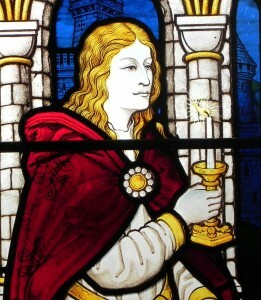 Janet Achurch played Lady Macbeth in a performance of the play which turned out to be of critical importance for the history of Shakespeare in Stratford. In April 1885 the Benson Company were in Leamington Spa and in the audience were Charles Edward Flower, the man in charge of the Shakespeare Memorial Theatre, and his wife, hoping to find someone to take over the artistic direction of the Festival for the following year. There is a full account of the performance in J C Trewin’s book Benson and the Bensonians. The evening started badly: the First Witch, George Weir, suffering from a mixture of nerves and alcohol, forgot his lines and began “The cat’s mewed three times”. Before Benson could deliver the famous Dagger speech the man in the flies mistook Lady Macbeth’s ringing of the bell for a cue to bring down the curtain. And when Janet Achurch as Lady Macbeth fainted after the murder of Duncan Benson carried her offstage hitting her against the set. And there were just as many accidents later in the play. Yet by a sort of miracle Benson convinced Flower that he was the right man for the Stratford Festival, and so began an association that lasted for three decades. Perhaps Janet Achurch impressed. 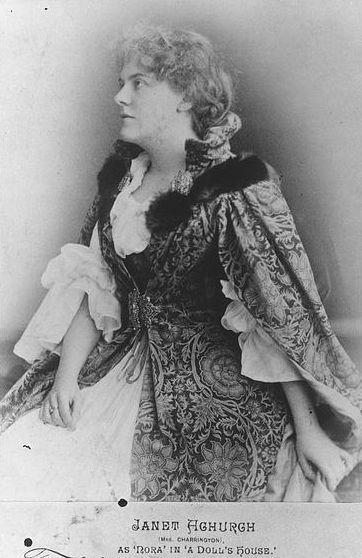 In spite of having become a professional actress only in 1883 when she was 20, she was already building a reputation. In 1884 George Bernard Shaw said she was “the only tragic actress of genius we now possess”. J. C. Trewin describes her as “a blue-eyed, fair, intense girl… with the aspect of a Brunnhilde and a fine arrogant bearing”. She spent most of 1885 with the Benson company, in what Ince describes as “the most disciplined rehearsal environment of her apprentice years”. Although a short period, it was crucial for her development. “It was under Benson that Achurch was exposed for the first time to the demands of Shakespearean roles, quite different to the stock farces, comedies and dramas she had previously played. Her abilities in this arena of dramatic representation were instantly apparent”. Achurch left Benson’s company at the end of 1885 and went on to work with other companies. Her personal life was difficult: her marriage had proved disastrous and she began to live and work with another Bensonian actor, Charles Charrington. While managing the Novelty Theatre they staged the first performance in England of A Doll’s House with Achurch as Nora on 7 June 1889. It’s perhaps significant that the last role she played before premiering Ibsen’s play was Lady Macbeth, in another revival. As soon as the London run ended they set off for a two-year tour beginning in Australia, where their daughter, who they named Nora, was born. During this tour Achurch almost lost her life giving birth to a stillborn child, and it was at this point that she became dependent on morphine, a drug which eventually caused her death in 1916 aged 52. Her association with Ibsen continued after her return to London in 1892, playing Rita in Little Eyolf and also performing in The Lady from the Sea. 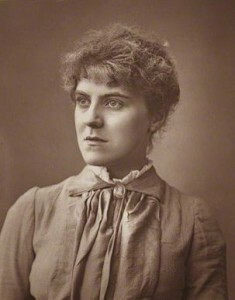 George Bernard Shaw admired her so much he wrote Candida with her in mind, and she took the leading role in the first production of his play Captain Brassbound’s Conversion. He talked about her “superfluity of power and the vehemence of intelligence which make her often so reckless as to the beauty of her methods of expression”. But although she achieved fame her recurrent illness prevented Janet Achurch from reaching her full potential, and cut her life short. Shakespeare was not a major part of Janet Achurch’s career. But sixteen years after her early death her loss to the theatre was important enough to justify her being commemorated in the Benson window during 1932. Her portrayal in the tragic role of Lady Macbeth was appropriate, but not because she had taken part in that fateful performance in Leamington Spa. If you want to see the window, it’s in the Ferguson Room of the Royal Shakespeare Theatre, as are all the Benson Windows. This entry was posted in Shakespeare on Stage, Stratford-upon-Avon and tagged Australia, Charles Edward Flower, Frank Benson, Henrik Ibsen, Janet Achurch, Macbeth. Bookmark the permalink.